SHANGHAI — It's now possible to check in automatically at Shanghai's Hongqiao airport using facial recognition technology, part of an ambitious rollout of facial recognition systems in China that has raised privacy concerns as Beijing pushes to become a global leader in the field. 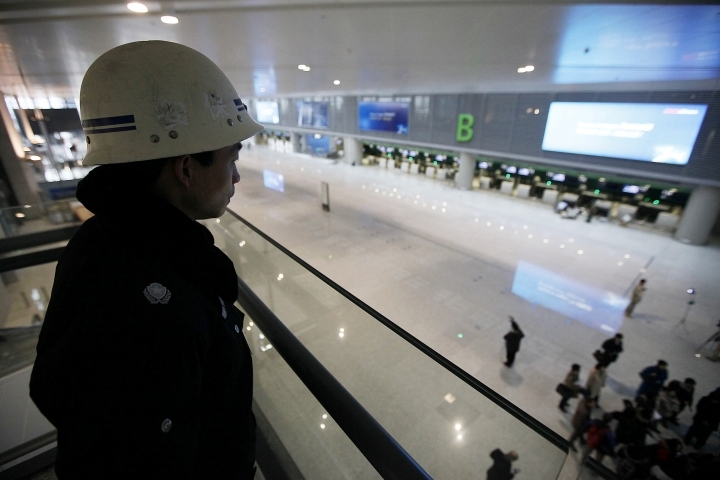 Similar efforts are underway at airports in Beijing and Nanyang city, in central China's Henan province. Many airports in China already use facial recognition to help speed security checks, but Shanghai's system, which debuted Monday, is being billed as the first to be fully automated. "It is the first time in China to achieve self-service for the whole check-in process," said Zhang Zheng, general manager of the ground services department for Spring Airlines, the first airline to adopt the system at Hongqiao airport. Currently, only Chinese identity card holders can use the technology. Spring Airlines said Tuesday that passengers had embraced automated check-in, with 87 percent of 5,017 people who took Spring flights on Monday using the self-service kiosks, which can cut down check-in times to less than a minute and a half. Across greater China, facial recognition is finding its way into daily life. Mainland police have used facial recognition systems to identify people of interest in crowds and nab jaywalkers, and are working to develop an integrated national system of surveillance camera data. Chinese media are filled with reports of ever-expanding applications: A KFC outlet in Hangzhou, near Shanghai, where it's possible to pay using facial recognition technology; a school that uses facial recognition cameras to monitor students' reactions in class; and hundreds of ATMs in Macau equipped with facial recognition devices to curb money laundering. But increased convenience may come at a cost in a country with few rules on how the government can use biometric data. "Authorities are using biometric and artificial intelligence to record and track people for social control purposes," said Maya Wang, senior China researcher for Human Rights Watch. "We are concerned about the increasing integration and use of facial recognition technologies throughout the country because it provides more and more data points for the authorities to track people."